As a white belt, it’s easy to fall in love with all the complex moves you see being done by professional fighters and trying to emulate them during practice. But, given your inexperience, you’re years removed from doing those consistently. You may even injure yourself if you try.Now, this isn’t to say that you have no talent. Rather, this is to say that it’s best that you start with the basics. Yes, sure, they’re not as flashy, but every professional JiuJitsu fighter will tell you that they also started with the basics and tried their best to master them to become who they are today. Speaking of basics, the Upward Lift Escape (Under Mount) is an example of such a technique and if you’re interested, here’s how you do it. With your opponent in the mount, you need a way to escape, preferably one that’s quick and reliable. As your opponent attempts to attack you, grab their right wrist with your right hand. Make sure that you cup it properly, with your thumb over the top. Doing so makes it difficult for opponent’s to pull away their hand. Grab your opponent’s elbow using your left hand, securing your hold on the right arm. Secure your opponent’s right ankle as well by taking your left foot and placing it over the right ankle. Now that you’ve secured much of the right side of your opponent’s body, they won’t be able to brace themselves when you try to roll onto your left shoulder. Without any means of preventing the roll, you’re just one step away from reversing the mount or completing the escape. Make sure that you raise your hips straight up as well before rolling onto your left shoulder, as this helps make the roll easier and much more effective. 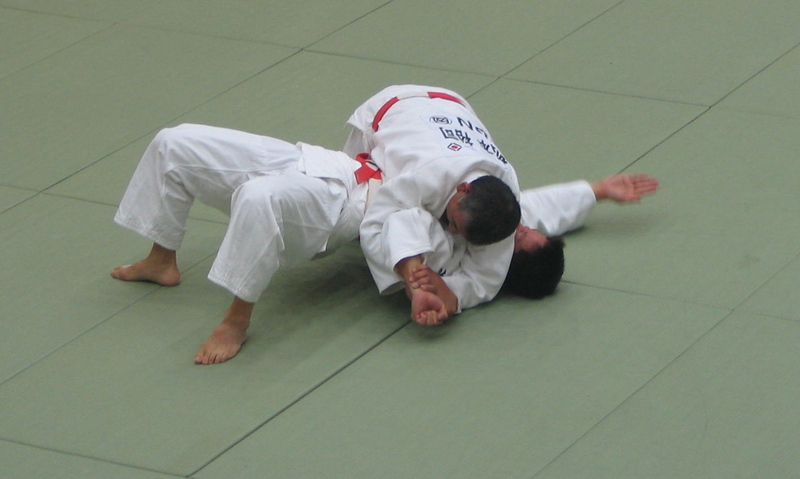 You’ll usually end up in your opponent’s guard after rolling over. Be reactive and secure their arms as soon as you’re on top to prevent any counters, namely chokes or arm-locks. Your opponent’s guards may not be a place you want to be at times, but it’s a lot better than them being in the mount. Speaking of escapes, there are three things that you’ll want to remember at all times and these are: frame, create space and move. Remember, don’t panic and always try to frame and create a space to move into. Both aren’t easy to do and the latter will require both technical skills and stamina. However, the proper application will save you a lot of energy in the long run and make it easier for you to escape as well. During practice and sparring sessions, try to visualize everytime you find yourself in a bad situation and try to improve on it the next time around. The more you think about ways to escape and the more you practice, the easier it is for you to find the space necessary to wiggle out and escape the next time around.